The Button Size slider affects the size of interface items. Setting the slider to a higher value will increase the size of buttons, switches and so on. However, note that the text on the buttons does not increase in size. After setting the slider it is necessary to restart ZBrushCore before the change will take effect. 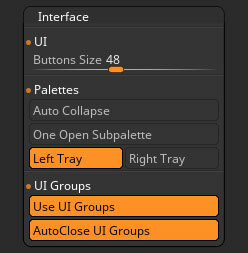 If the Auto Collapse switch is turned on, ZBrushCore attempts to keep all palettes visible in the Left and Right Trays. If space is needed to accommodate a newly-expanded palette then other palettes will be automatically collapsed. With the switch turned off, all palettes will remain expanded unless you close them by clicking on their title bars. You can access the palettes by sliding the tray panels up or down – the cursor will changed to a double-arrow.